We have rental availability in all sizes of our mailboxes, small, medium, and large. Pakmail provides a secure place to receive mail and packages, and provides a street address for your convenience. There is optional 24 hour access as well. The rental fees will depend on the term length and mailbox size, but we do have specials for customers who rent for 6 months or a year. A 6 month rental includes a month free, for a total of 7 months. A year rental includes 3 months free, for a total of 15 months. Our minimum rental is 3 months if you are just looking for something temporary. For rates, please call 602-971-2300. At Pakmail, we offer a variety of shipping services, from standard USPS services, to overnight and expedited shipping through FedEx or UPS. We have international shipping options, which include USPS, FedEx, UPS, and DHL, which is the most secure way to ship and usually the quickest. Our staff will show you the different service options, whether you need your package to arrive the next day, or if you don’t mind it taking the slow boat. We specialize in art and antique shipping, and we can pack up your items with great care for transport. Our hours are Monday-Friday 9AM-6PM and Saturday 10AM-2PM, so stop in and we’ll be glad to help you! New customers can receive a 10% discount off our services, excluding USPS. Just mention you saw our post! Immediate Availability – Rent any size box, today! Privacy, Security and Confidentiality – You decide who has access to your mail. 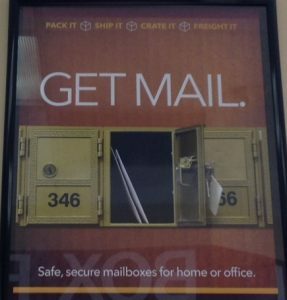 Your mail and packages are safe with us. Eliminate the worry of stolen checks and valuable items left on your porch. 24-Hour Access & Convenience – Pak Mail offers one-stop shopping for all of your mailing, shipping, and business support needs and access to your box 24 hours a day. Never again go to the Post Office and take a number for “service”. Package Receiving & Fax Receiving – We’ll sign for packages with your permission, even CODs! No more missed deliveries! Street Address – The prestige of a street address over a standard PO Box. Mail Forwarding – Just let us know where you want it and when! Are you unpacking from a move and have excess packing peanuts and/or bubble wrap? Did you order from Amazon and your items were over packed, so you have no use for the excess materials? We will use clean packing peanuts and bubble wrap as long as there is not tape all over it. We will take styrofoam padding and air pockets as well. Unfortunately we can’t re-use cardboard boxes because we have to use new ones for security in shipping. You don’t have to call ahead, just bag it and bring it in and we’ll greatly appreciate it! Faxing, Copying & Laminating Services! While we can ship almost anything you bring to us, we also have copying, faxing and laminating services. Our black and white copies are just 25 cents! You can fax your papers or receive a fax here at 602-992-3222. Local faxes are $1.00 for the first 10 pages, then $0.50 for each one following. Crating and Freighting! Pakmail Does It All! Not only does Pakmail ship small packages via FedEx, USPS, UPS, and DHL, but we can handle any size shipment by shipping through a freight carrier. Whether it is one large item, such as a couch or mattress, or several rooms worth of items, we can pack and ship them on a pallet or several pallets if needed. Freight shipping is reliable and safe because your items are all kept together, strapped to a pallet and the recipient is notified before the delivery so they can be there to receive it. We offer insurance for freight shipping, so in the unlikely event of damage, we can file a claim on your behalf. We can ship anywhere in the US, and internationally as well. Please give us a call at 602-971-2300 or email info@weshipphoenix.com for an estimate! We Take Drop Offs – FedEx, UPS, DHL & USPS! While Pakmail is an authorized shipping center for FedEx, UPS, and DHL, we also accept prepaid drop offs for them. We can give you a receipt with the tracking number as well. FedEx Ground pick up time is 4 PM during the week. FedEx Express pick up time is 5 PM during the week and 12 PM on Saturdays. UPS pick up time is 5 PM during the week. DHL drop offs must be here by 3:30 PM to be picked up the same day. Our USPS pick up is usually by noon during the week and on Saturdays. We Ship for Auctions & Galleries! Call 602-971-2300 for an Estimate! We regularly work with local auction houses, to pack and ship items for customers who are unable to pick them up, whether they’re out of state or out of the country. We use FedEx, USPS, UPS, or DHL to find the least expensive method for shipping packages of all sizes, such as artwork, pottery, and antiques. We also ship larger items, such as furniture and grandfather clocks by freight. If you are interested in an item and would like an estimate on the shipping cost, just call 602-971-2300 or email us at info@weshipphoenix.com.